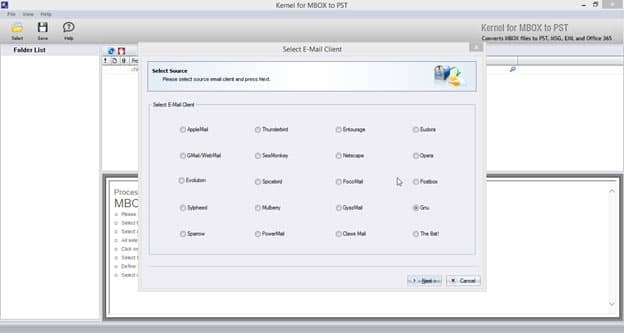 Select ‘GNUMail’ form the given MBOX clients. 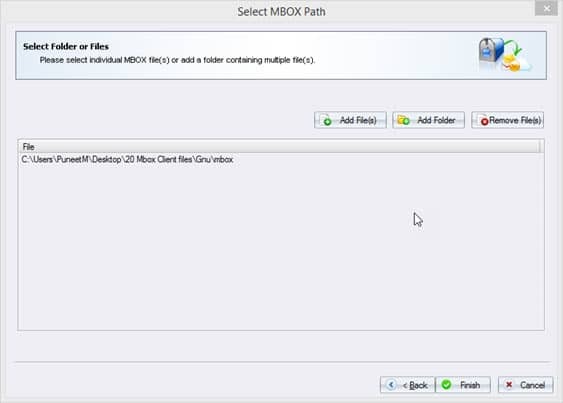 Click ‘Next’ to proceed to add GNUMail MBOX files to the converter application. 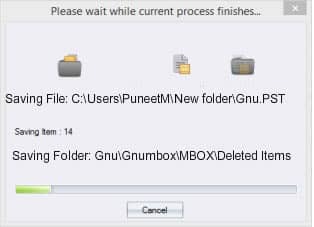 Add GNUMail MBOX files by clicking ‘Add File(s)’. To remove any of them click ‘Remove File(s)’. Once done, click ‘Finish’ to proceed. 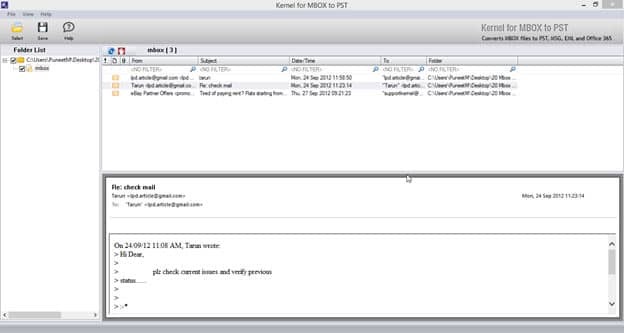 A window will open providing the detailed account about the added GNUMail MBOX file. To save them, click ‘Save’ button. Once done, a window with different conversion options will appear. 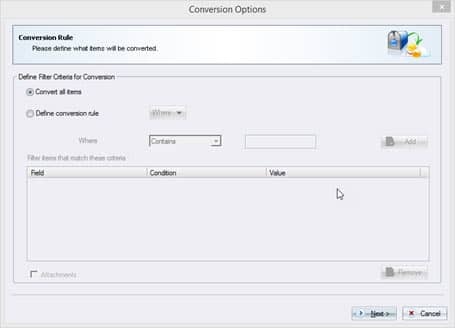 Make selection from either of them: ‘Convert all items’ and ‘Define Conversion Rule’. To convert all items, select ‘Convert all Items’ followed by ‘Next’. 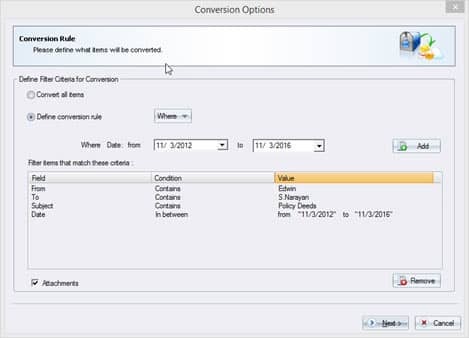 To make specific selection user has to define conversion rule using ‘Define Conversion Rule’. It entails different options like From, To, Subject and Date from ‘Where’ drop-down menu. Specify a value that is either contained or is not contained in the “From” field. Enter a value contained or not contained in the “To” field. Provide the required value for “Subject” field. Specify the date range with the help of a “date” field. Click ‘Next’ to proceed into saving option. In next window click ‘Save in PST’ from other options like ‘Save in EML’, ‘Save in MSG’ and ‘Save in Office 365’. 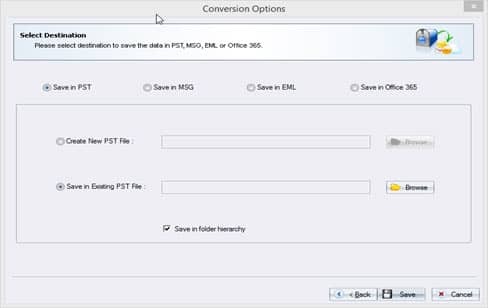 Make a selection to save the required data between ‘Create New PST File’ and ‘Save in Existing PST File’. If new PST file is to be created, then click ‘Create New PST File’ and with ‘Browse’ button to provide the destination of the respective file. However, if you desire to save the data in the pre-existing PST file pre-exists, then simply click on ‘Save in Existing PST File’ and provide the file path by using ‘Browse’ button. Click ‘Save’ button to proceed the conversion and saving process. 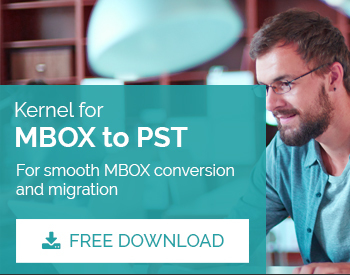 Once the entire MBOX to PST conversion process get completed a completion message appear on the screen.